Santorini bus line connections will give you the opportunity to visit almost every part of the island. Santorini bus routes connect villages and beaches with the capital of the island. Therefore sometimes you will have to reach Fira first, in order to continue your trip. To get to your hotel after your arrival on the island, via ferry or airplane, take Santorini bus to Fira. From the same spot you will take a bus to the location of your hotel, e.g. Oia, Imerovigli, Firostefani etc. If you arrived on our island by ferry, after you disembark walk along the port and you will see Santorini bus line vehicles waiting for passengers. They have a sign “ΚΤΕΛ” on the front window. If you arrived on Santorini by plane, you will see the vehicles of Santorini bus line just outside of the airport building. As we mentioned before that the main intersection of Santorini bus is the capital of the island, Fira. So, if you like to visit some famous beaches on the south coast of the island, like Perissa and you are staying in Imerovigli, you will take the bus to Fira first and then you will switch to another, towards Perissa. The tickets of Santorini bus line is quite cheap, varying between 1.80 Euros and 2.50 Euros. The night ticket, from 00:30 till 05:00, is about 0.50 cents more expensive. The schedules are frequent, especially the ones connecting the main settlements. 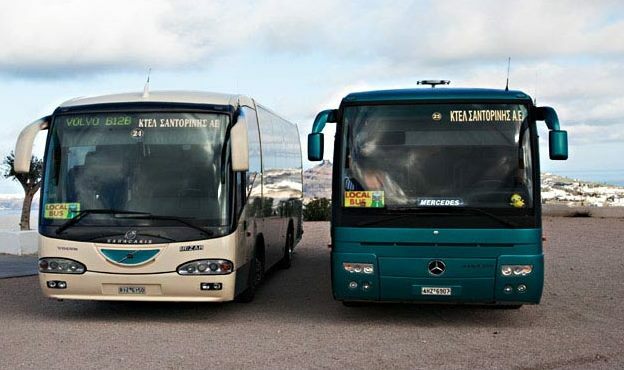 Every 20 minutes there is a bus from Oia to Fira, from Fira to Akrotiri or Mololythos etc. If you like to get to your hotel fast, after arriving on the island, you don’t have to use the bus line. Members of Santorini Hotels & Suites can arrange a transfer for you. It varies between 30 and 50 Euros, depending on where your accommodation is located. The driver holds a sigh with your name and will assist you with your luggage.